INTERNAL DIMENSIONS: 115 x 76 x 48 mm ; Comes with a 3-Year Manufacturer’s Warranty! The USA Gear FlexArmor Protective Sleeve utilises dense neoprene material to provide rugged, high-impact protection against bumps, drops and shock. This soft, scratch-resistant material cradles & conforms to your camera to keep it looking like new, while a sleek design provides style to the snug & secure fit. Compact and lightweight, this case is ideal for backpacks, napsacks, purses, handbags, etc. Use the built-in heavy-duty belt loop to capture a shot at a moment’s notice! 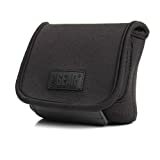 The FlexArmor Protective Sleeve has a zippered pocket for storing small accessories like memory cards or batteries. Backed by a 3-Year Manufacturer’s Warranty! This entry was posted in Discount Photography and tagged Belt, Camera, Carrying, Case, Compact, Coolpix, Digital, DSCW800, Gear, Holster, Loop, Lumix, More, Nikon, Padded, Panasonic, Pouch, Sony, Travel by Ball Photo. Bookmark the permalink.